During the summer, most weekends you will find me spending time outdoors, however, come wintertime, that is totally out of the question. So, most weekends, I end up at the mall. A day of shopping is one of my favorite weekend activities - I love going from store to store window shopping & snatching up the latest fashions & accessories. My trips to the mall are never complete without a pit stop at my local Jamba Juice to refuel! They have always had the BEST smoothies and juices, but waiting on line when there's shopping to do isn't always fun. Problem solved(! ), Jamba Juice now carries ready-to-drink Cold Pressed Juices that are delicious & perfect for those on-the-go shoppers like me! I'm not sure if it's the friendly staff, the bright colored decor or the products themselves, but something about Jamba Juice make me so happy. Just like their juices, visiting their counter gives me a burst of energy & excitement. It can be so difficult for a girl-on-the-go to get the recommended amount of fruits & veggies, but grabbing one of these Fresh Squeezed Juices is the perfect way to get your recommended number of servings into your day. Each bottle has 3 servings full of vitamins, minerals and fiber that you need for a balanced, healthy diet! Also, the flavors are SO delicious. Orange Reviver (a blend of oranges, apples, bananas & beets) is my favorite flavor - the mix of ingredients is delicious - & it is great for keeping my energy high during my day of shopping! The other flavors include Veggie Harvest (super-greens with added apples, carrots, beets & ginger), Tropical Greens (super-greens with apples & pineapples) & J's favorite, Citrus Kick (oranges, apples, pineapples & ginger). Yum, yum! Visit the Jamba Juice website to learn more about their latest products & find your nearest location so you can taste the goodness for yourself! The Fine Print: Michelle's Pa(i)ge is giving away a few of her favorite mall items, including one Jamba Juice gift card valued at $20, one Aerie blanket scarf in color: Soft Muslin & one Alex & Ani gold Anchor bangle. The products offered in this giveaway are free of charge; no purchase is necessary. This giveaway is open to US entrants only. 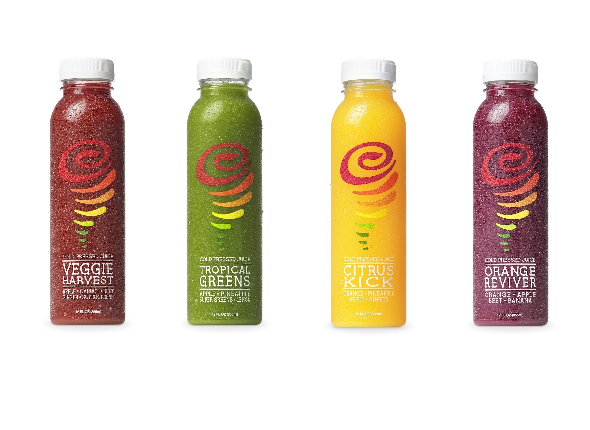 Required entries include leaving a comment on the original blog posting titled 'Juice by Jamba,' letting the blog owner know which Jamba Juice cold pressed juice flavor you want to try. Entrants must be a follower and/or subscriber of Michelle's Pa(i)ge blog in order to win. For additional entries, readers can tweet about this giveaway as well as follow Michelle's Pa(i)ge on social media platforms, including Facebook & Instagram. This giveaway will last for 10 days, beginning on 2/20/15 at midnight and ending on 3/2/15 at midnight. One winner will be chosen based on entries & random generating by Rafflecopter. Winner will be selected at random by Rafflecopter & Michelle's Pa(i)ge and will be notified by email. Michelle's Pa(i)ge will use contact details provided solely for the purpose of contacting the winner and shipment of the prizes. Winner will have 48 hours to respond before a new winner is selected. All opinions are solely those of Michelle's Pa(i)ge. Facebook, Twitter, Instagram, Google+, and any other social media platforms are in no way associated with this giveaway. This post is brought to you by Izea. All thoughts/opinions are my own. Thanks Mel! Enjoy your weekend! Finally! Someone who is obsessed and loves Jamba just as much as I do! Some people just don't get it, others think its weird. But finally! Someone who knows what it is like! How can you not be obsessed?? So delish! I love drinking healthy juice (because...it's healthy haha), but it can sometimes taste pretty weird. This juice looks delicious! I totally feel you - the dark red color of this one threw me off at first, but it is truly SO yummy! I love the chucks and the scarf. Great giveaway by the way. Thank you - the giveaway gives you the chance to win a similar scarf! I would love to try the green juice!!! Looks yummy!! I would love to try the Tropical Greens. I would like to try Citrus Kick. The tropical greens flavor sounds really good! The Orange Reviver and the Tropical Greens both sound really good! I'd love to try Citrus Kick! Thanks! The citrus kick sound super delicious to me. I'd really like to try the Citrus Kick! I love pineapple so that's perfect for me! (BTW, the link in the rafflecopter didn't work-I hope it's okay that I commented here.) Thanks! I'd love to try Citrus Kick, it looks so good! I would like to try the citrus kick. I would love to try the tropical greens! I want to try veggies harvest! I want to try Tropical Greens. I would love to try Tropical Greens! I Adore Jamba Juice! the Citrus Kick sounds delicious! I'm all about the Orange Reviver. Beets and orange juice! These are delish! Similar to the juices they make in store, minus the wait time! The Citrus Kick sounds so refreshing! Thanks for the giveaway! I am most interested in the citrus kick variety. Love your scarf!! The Veggie harvest sounds delish! I want to try the Citrus Kick. I want to try the Orange Reviver. I want the citrus kick! I would love to try the Citrus Kick...you can't go wrong with a blend of oranges, apples, pineapples, and ginger!! I'd love to try the Orange Reviver from Jamba Juice!